What if my mechanical weight driven chimes / hour strikes seem exceptionally very fast or slow? What if my mechanical clock is in the 'night off' position and it is silent during the day instead of the night? What if my clock will not keep proper time/it is fast or slow? What if my pendulum hits the weights? What if the weights do not drop at the same rate? What if the top of my dial is tilted back and the hammers are not properly aligned with the chime rods? Where are the key, crank, and weights located in the floor clock carton? What is meant by 'triple chime'? What is the function of the moon dial? What should I expect when my floor clock is professionally set-up? How do radio controlled clocks work? What if my radio controlled clock does not operate? What if my radio controlled clock shows the correct time for another time zone? Who should I contact to have my clock cleaned and oiled? What if my clock is out of warranty and needs service? Where are the shelf clips and key located on my collectors cabinet? How do I purchase additional shelves for my collector?s cabinet? What if the door on my collector?s cabinet rubs at the bottom? How do you recommend that I clean and maintain my collector?s cabinet? What if I need a part? This trouble shooting is detailed in the clock instructions that you should have received with your clock. The instructions may include illustrations. Ensure that all of the packing material has been removed. If the clock is a pendulum type, ensure that the spring clip or rubber band has been removed from the back of the movement. Try re-starting your clock. For pendulum clocks, it is important to give the pendulum a full swing. Is the pendulum hitting the weights? If so, check the stability and level of the clock. Do the hands operate without interference? Do not let the hour hand hit the second hand. If the second hand is rubbing the dial, pull it out slightly. If the hour hand is rubbing against the back of the minute hand, the hour hand should be pushed closer to the dial. Did you check the suspension spring? If it is not hanging straight down, loosen the thumbscrew and straighten the suspension spring. Retighten the thumbscrew. Ensure that the verge pin is properly located in the slots of the pendulum guide. Ensure that the clock is wound or the weights are up. If your clock has a moving moon, ensure that the moon is not caught on the click spring. Reference the instructions for further details and illustrations. If your clock is a cable driven clock and was previously run or the white Styrofoam blocks were removed from the cable pulleys, it is possible that the cables were wound up without weights left on the pulley. As a result, the cable(s) have overlapped on the drum(s). Check each cable on each drum to see if it is overlapped. If so, attempt to correct the cables so that they are not overlapped. If you cannot correct the cable, contact a local clock repair outlet. Correcting this problem is not covered under warranty. This trouble shooting is detailed in the clock instructions that you should have received with your clock. The instructions, which may include illustrations, are also available at this Internet site. If the clock is new, allow it to operate for several hours before making any adjustments. If the strike is off, grasp the HOUR HAND ONLY and rotate it forward or backward to line up with the correct hour on the dial indicated by the number of times the hour strikes. Rotating this hand independently will not harm the movement. Then adjust the hands to the correct time by rotating the minute hand counter-clockwise as explained in the instructions. DO NOT MOVE THE HANDS WHILE THE CLOCK IS CHIMING OR STRIKING. After a few hours, the movement's self-adjusting feature will synchronize the hands with the correct chime and strike. Make sure that the strike on/off lever in not in the 'strike off' position or halfway between positions. Make sure that the movement is not in the 'night off' position. Make sure that all the packing material is removed from the movement area. You should be able to carefully pull each hammer back away from the rod approximately one inch. If your clock is a cable driven clock and was previously run, it is possible that the cables were not wound up with the weights left on the pulley. When this happens, the cables overlap on the drum. Check the cables on the drums to see if they are overlapped. If so, contact a local clock repair outlet. Correcting this problem is not covered under warranty. Be certain that the weights are in their proper location. The proper position of the weights as you are facing your clock is labeled on the bottom of each weight. This trouble shooting is detailed in the clock instructions that you should have received with your clock. Reference the illustrated details contained in the instructions on how to perform this step. Rotate the minute hand counterclockwise twelve hours. . DO NOT MOVE THE HANDS WHILE THE CLOCK IS CHIMING OR STRIKING. This trouble shooting is detailed in the clock instructions that you should have received with your clock. The instructions, which include illustrations, are also available at this Internet site. DO NOT ADJUST THE CHIME HAMMER, unless the chime tone is incorrect. The chime tone may be affected by the hammer resting on the chime rod (coil) or striking the rod (coil) off center. Although the hammers were set at the factory, it is possible for the hammers to get out of adjustment. Contact manufacturer for a replacement rod. 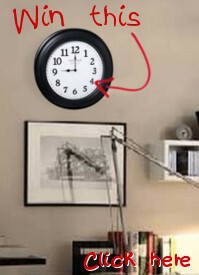 The clock may not be level. Level the clock. When setting the clock back one hour, rotate the minute hand counterclockwise one-hour. When setting the clock ahead one hour, rotate the minute hand clockwise one-hour. When moving the hands forward, it is important to allow the clock to chime every quarter hour (1/4, 1/2, 3/4, 1) before advancing the hands to the next quarter hour position. . DO NOT MOVE THE HANDS WHILE THE CLOCK IS CHIMING OR STRIKING. This step is detailed in the clock instructions that you should have received with your clock. The instructions may include illustrations. Floor Clocks / Cables with Pulleys / Weights that are suspended by cables with pulleys should be raised by using the crank provided. DO NOT lift the weights by hand while cranking. Insert the crank into the holes located in the dial face. It does not matter in what order the clock weights wound. All weights need to be wound to the up position. Floor Clocks / Chains - Pull straight down on the chains. DO NOT lift up on the weights as this could cause the weight to come unhooked from the chain. Pull down on the loose end of the chain until the weight is approximately 2 inches from the bottom of the wood movement mounting board. It does not matter in what order the clock weights wound. All weights need to be wound to the up position. Wall and Mantel Clocks - Insert the winding key into the holes located in the dial face. Depending upon the model of your clock, there can be 1, 2, or 3 winding keyholes. Turn the key clockwise until the spring becomes tight and will not turn further. For clocks with hanging weights, raise the weights using the crank. DO NOT lift the weights by hand while cranking. Wind your clock once a week. It does not matter in what order the clock weights wound. All springs must be fully wound. When the automatic nighttime shut-off feature is selected, and on some models when 'silent' is selected, the center weight will drop at a faster rate than the other weights. This is often an indication that the clock has been dropped on its back during freight from the factory to you. Often, this type of 'concealed damage' is not visible from the outside of the carton. Inspect for other possible damage. Notify the freight carrier and dealer in writing immediately and request a carrier inspection and damage report. Failure to notify the freight carrier within 14 days of product receipt by the original consignee may waive your rights to a damage claim. It is possible that significant damage did not occur and components only shifted as a result of being dropped. In most cases, this problem can be easily corrected by the dealer or Service Center. The key, crank, and weights are all packed in a white styrofoam carton under the clock. Care should be taken whenever you move your clock to ensure that all accessory parts such as pendulum, weights, etc. are removed and packed properly to prevent damage. Use cotton gloves or a soft cloth when handling the pendulum or weights. For clocks with a cable driven movement, wind the weights all the way up. For clocks with chains, use a long wire or string and put it through the chain links just below the chain sprocket. When done properly, the wire or string should go through six chain links. Secure the wire or string to prevent the chains from coming loose from the sprocket. Carefully stop the pendulum from swinging. Remove the weights. NEVER wind the clock without the weights installed. For clocks with chains, secure the chains so that they do not damage the finish. Keep the clock in an upright position while carefully moving it to its new location. Set the clock up per the original set- up instructions. Ensure that the pulleys are properly located on the cables and the chains are properly located on the sprockets. When properly set as detailed in the instructions, the moon dial tracks the lunar month and the cycle of the full moon. Treat your home the same way they would treat their own. Completely set-up the clock following the set-up instructions in the order in which they are detailed in the instructions manual. Ensure that the clock is level and stable. Ensure that the clock runs continuously for a minimum of 10-minutes. Ensure that the clock strikes the correct hour. Ensure that the chime is correct and the hammers are properly positioned. Ensure that the pendulum swings properly. Ensure that the moon dial is properly set. Ensure that you have all the parts. Review the instruction manual with you. The problem area is typically the negative end of the battery. Ensure that the negative battery contacts are positioned completely on the metal contact area of the battery. As necessary, bend the battery contacts out to ensure that they are not making contact with the battery casing. If necessary to ensure a proper contact on the negative end of the battery, take a 1 inch by 1 inch piece of aluminum foil and fold it over tightly to the size of 1/4 inch by 1/4 inch and place it between the battery contact and the battery. Chime volume is off or lower during the day and louder at other times: The nighttime volume reduction or shut-off is not properly set. Reset the nighttime shut- off. Chime is off / will not chime: Ensure that the chime is not in the 'OFF' position. If this does not solve the problem, replace the batteries. Radio controlled clocks or Clock Radio receive a signal from the NIST Radio station WWVB located near Fort Collins, Colorado. WWVB continuously broadcasts time and frequency signals at 60 kHz. WWVB provides standard time information, including year; time intervals; Daylight Savings Time, leap second, and leap-year indicators. The transmitted accuracy of WWVB is normally better than 1 part in 100 billion with day-to-day deviations less than 5 parts in 1000 billion. Due to the effects of the many communication devices used throughout the United States (more so during the day than at night, and more so during the week than the weekend), the WWVB transmission is easier to receive at night and during the weekend. If the clock was provided with a battery installed, ensure that the plastic cover is removed from the battery and that there's no insulator strip between the battery and the contact. After following the details below and the clock still does not work, install a fresh new alkaline battery. Geographic features, weather disturbances, and structural characteristics can affect the strength of the radio signal. The clock will not operate properly until it receives a signal - it will look for a signal on a regular basis. If the movement in your clock is the type where you select the time zone by turning a knob on the back of the movement, it may stop if it does not receive a signal for an extended period of time. To start the clock, remove the battery and insert it backward (reverse polarity). Remove the battery again and reinstall it correctly. Then reference the detail below on locating your clock. Within several feet of an electrical raceway, radio transmitter/receiver, personal computer, television, satellite dish, air conditioner, light dimmer switch, electrical motor, microwave oven or any other appliance that could interfere with the clock's reception of the radio signal. In enclosed areas and structures of concrete and steel such as a basement, office building or factory. For best performance try to place the clock near a window, preferably a window that is facing Fort Collins, Colorado. Best signal reception occurs between 10:00 PM and 5:00 AM - particularly during the weekend. If you live in an area that receives the signal but does not adjust for daylight-savings time, select ST (standard time) from the back of the movement while the rest of the country is in daylight-savings time and manually set the movement to the correct local time. When the country returns to standard time, select your time zone from the back of the movement. Ensure that your time zone is selected from the back of the movement and wait for the clock to receive an updated radio signal. Best signal reception occurs between 10:00 PM and 5:00 AM - particularly during the weekend. Disregard the words 'rain', 'change', and 'fair' as these are only traditional zones on the barometer dial. Your barometer indicating hand will never move all the way to 'rain' to predict inclement weather. The normal operating range of movement for your barometer indicating hand is from 29.5 to 30.5 inches of mercury. Your most extreme readings would occur before a hurricane or tornado, for example, when barometers readings have dropped as low as 28.5 inches of mercury. Tap the instrument lightly to release and latent action. It is recommended that your clock movement be oiled every two years from the date of purchase and thoroughly cleaned every five to ten years depending upon climatic conditions. Extremely dry, humid or salty air, hot or cold may necessitate more frequent servicing. We do not recommend that you service your clock yourself. Contact an authorized Service Center or repair shop. Cleaning and oiling are not covered under warranty. Contact a local Service Center or repair shop. Cleaning and oiling are not covered under warranty. Wax and polish your cabinet as frequently as you would other fine furniture. Use a good furniture polish or past wax. Apply the polish to a soft cloth - do not spray or apply directly to the case. Do not use a silicone-based product. Use extreme caution when cleaning the glass. Use a quality liquid non-ammonia glass cleaner. Apply the glass cleaner to a soft cloth - do not spray or apply directly to the glass. It is recommended that your clock movement be oiled every two years from the date of purchase and thoroughly cleaned every five to ten years depending upon climatic conditions. Extremely dry, humid or salty air, hot or cold may necessitate more frequent servicing. We do not recommend that you service your clock movement yourself. Contact a local Service Center or reair shop. Cleaning and oiling are not covered under warranty. We do not recommend that you service your clock movement yourself. Contact a local Service Center or reair shop. Cleaning and oiling are not covered under warranty. The shelf clips and key are either packed inside the case or they are in a plastic bag taped to the back of the cabinet. How do I purchase additional shelves for my collectors cabinet? Additional shelves are available for a reasonable charge. Contact your local dealer. Have your model number, serial number, and charge card readily available before placing your call. What if the door on my collectors cabinet rubs at the bottom? Since the door has a wood frame with very heavy glass, it is possible that the door may rub although the case may be square as measured using a carpenter level. If the door rubs, it is necessary to adjust the floor levelers at the bottom of the cabinet. First, remove the collectibles from the cabinet. Release the pressure from the front of the cabinet and screw the right-front leveler out approximately one full turn. Do not adjust the left front leveler at this time. Allow the cabinet to settle into the foundation. Continue to adjust the right-front leveler out to the point where the left-front leveler does not fit snug on the floor. Allow the cabinet to settle into the foundation and adjust the two rear levelers and then the left- front out such that the cabinet does not wobble. On a soft foundation, settling of the cabinet into the foundation will provide a snug fit of all levelers over time. Make further find adjustments to ensure that the cabinet is not leaning forward or wobbling. Recheck the shelf clips and shelf location on all clips. As desired, place collectibles into the cabinet. Allow the cabinet to set a minimum of two weeks before further fine adjustments. As necessary after two weeks, repeat the steps above. How do you recommend that I clean and maintain my collectors cabinet? If your purchase is new, is missing a part, and was not in the original carton, contact the location where you purchased the item. This will be the quickest and easiest way to obtain parts that they likely have, but failed to provide. If your clock is new, is missing a part, and was in the original carton, carefully check the packing material. Our manufacturers take great care to include all parts with every item. If your are confident that the item is missing, contact us right away. Have your model number, serial number, and sales receipt available before you place the call. If your clock is not new or if a part is damaged and parts are required, contact Howard Miller Customer Service at (616)-772-7277 or go to the QUESTION section at the bottom of this site and detail the part that you need. Have your model number, serial number, and credit card available before you place the call. Please email us and we will find an answer. Please be certain to enter your complete email address correctly so that we can respond.